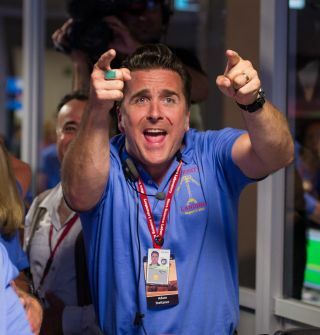 Mars Science Laboratory (MSL) Entry, Descent and Landing Engineer Adam Steltzner reacts after the Curiosity rover successfully landed on Mars and as first images start coming in to the Jet Propulsion Laboratory, Sunday, Aug. 5, 2012 in Pasadena, Calif. The leader of the team that landed NASA's huge Curiosity rover safely on Mars this past August has been named one of 2012's most important and influential scientists. The prestigious scientific journal Nature recognized Adam Steltzner as one of its "10 people who mattered this year" in its end-of-year issue, which was published online today (Dec. 19). Steltzner, an engineer at NASA's Jet Propulsion Laboratory in Pasadena, Calif., headed Curiosity's entry, descent and landing (EDL) team, which pulled off a bold, unprecedented and seemingly improbable touchdown on the night of Aug. 5. In a move never tried before on another planet, a rocket-powered sky crane lowered the 1-ton rover to the Martian surface on cables, then flew off and crash-landed intentionally a safe distance away. The maneuver capped a nail-biting EDL sequence that Steltzner and other members of the Curiosity team had dubbed "seven minutes of terror." The success of the touchdown could have far-reaching consequences for space exploration. Earlier this month, NASA announced that it's planning to launch another rover to the Red Planet in 2020, using Curiosity's chassis and EDL strategy as a baseline. And agency officials have said that the sky crane could also be employed to land large components of a future human settlement on Mars. The $2.5 billion Curiosity rover is now chugging around the Red Planet's huge Gale Crater, investigating whether or not Mars has ever been capable of supporting microbial life. The six-wheeled robot carries 10 scientific instruments to aid in this quest, including gear that can detect organic compounds — the carbon-containing building blocks of life as we know it. Curiosity has already found an ancient streambed where water flowed continuously for thousands of years long ago. It has also identified some simple organics on Mars, though researchers aren't yet sure if the carbon within the molecules is native to the Red Planet.